Ski Zenit is based in Grimentz, the main ski resort in the authentic old-style Swiss valley of Val d’Anniviers. Surrounded by majestic 4000-meter peaks is the perfect headquarters for our racing, freeriding and private lesson programs. With one ski pass we have the ability to explore all five resorts in the Val d'Anniviers allowing for endless options. Private lessons take place ensuring full customization of the learning experience via a highly skilled team of international professionals. Lessons are based in Grimentz-Zinal, but we have the ability to travel to nearby resorts upon request. Ski Zenit caters to skiers of all ages with a special multi-faceted approach for teenagers that will instill a love for skiing. Beginners – Grimentz is a paradise for the amateur skier with five beautiful areas to explore while building a solid skiing foundation. Our lessons for beginners will give any novice skier the confidence to progress quickly while having fun. Intermediate to advanced – The combination of Ski Zenit and the variety of runs that Grimentz has to offer will facilitate technical skiing development while exploring all types of terrain. Our instructors combine knowledge and experience to allow every skier find their true potential through dynamic lessons. Expert – Expert skiers will discover a challenging and unique way to streamline skiing technique and all-round skills by focusing on specific skills such as carving, race performance, bumps, short turns, off-piste snow and freestyle. Our highly experienced and certified instructors will increase the skill level of even the most advanced skiers. 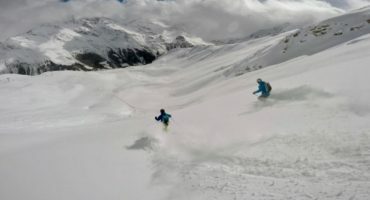 For those interested in experience racing or furthering past racing experience, Ski Zenit provides training sessions focused on ski-racing technique. Zinal has race training conditions that rival the best in Europe. We have access to private courses on excellent long runs with a variety of terrain and ideal snowpack for racing. Our training method strives to build a complete skier profile, including solid technical and tactical fundamentals as well as mental and physical strength both in and out of the race course. We can customize training programs for racers of all ages and abilities. We are recognized internationally for our expertise in youth racing development programs. If you are interested in learning more about our year-long competitive race programs, visit our specific racing website. Grimentz’s geographic location guarantees skiing from Christmas until mid-April. The historical valley is relatively undiscovered allowing for untracked conditionals weeks after the last snowfall. Val d’Anniviers offers every kind of terrain imaginable, steeps, pillows, wide-open terrain and extreme opportunities. Our guides love skiing in the Val d'Anniviers and over the years have become experts in navigating its terrain. Backcountry skiers of all levels will benefit from their insider knowledge and together will share the powder stoke while skiing endless perfect lines. Tours of different lengths accessing untracked powder are available depending on conditions. Avalanche backpack with kit (beacon, probe and shovel) are required and touring skis are recommended. Grimentz is situated at the heart of the Imperial Crown The imperial crown is a group of 4000 meter high peaks that go from the Weisshorn to the Dent Blanche. It has its own heli-port making heli-skiing directly from town available allowing for some of the best skiing in Europe. During certain periods of the winter season we have more flexibility with pricing depending on the number of participants. During less busy times we are also able to offer packages including housing, lodging, lessons, ski passes and other non-skiing activities to create an all around winter experience.